Even though Xander was born with a golden spoon in his mouth, never once was he brought up that way. He was raised to work hard and earn his keep. That's exactly what he's done. Bria Powers has worked for everything she's owned in order to make it through med school. She bartends at night and interns during the day. She is young and beautiful, but doesn’t have time for a man in her life right now. She barely finds the time to breathe on Saturdays, her only free day to herself. Being dragged to a motocross race one Saturday by her best friend, her world suddenly turns on its axis. She's focused on one thing only, to make it on her own. He's driven by his career and nothing else. Can they bend the rules to make it work? WOW! What an awesome read! I had the pleasure of helping out with this book and when chapters were sent to read, I wanted more. I couldn't get enough. The feelings that this book gave me were up and down. I smiled, I laughed (yes out loud), I cried & I got frustrated. When a book makes me feel the emotion the characters are giving, I automatically fall in love. Xander & Bria are strong, hard headed people. They are both focused on their medical careers and have no time for a relationship. The chemistry between these two made me giddy and gave me that "quiver" when they were together (which was absolutely HOT). They, however, tried to fight it every chance they got. Not an easy thing to do. They had their fun, but that was it. Or so they thought. I wanted to scream and shout at them when they fought against each other. They were meant to be, but decided they shouldn't. The twists Savana adds to the story blow my mind. Never saw them coming. Focused & Driven is a page turner til the end. Will Xander and Bria stop being stubborn and finally give in to what is meant to be? Or will they go their separate ways and move up in their careers like they had planned? If you want a hot, funny, yet sometimes heart breaking book to read, I recommend this one. It had it all! Jenna Munson has had her fair share of life events. Brought up under the guardianship of her brother Brennan, she was forced to grow up quickly. Her family was not built by blood alone, but by the love of music. Her life was full and complete with music, her band and… Drugs. 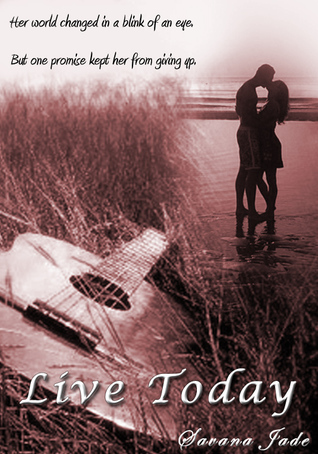 When Brennan introduces a new guitarist, Gabriel, Jenna’s world shifts on its axis. After a tragic accident, she decides to reshape her life. A new home, a new beginning. The only thing she wasn’t counting on was her growing feelings for Gabriel. Even though Gabriel’s attraction for Jenna grows as well, she is afraid to be another one of his conquests. Use to a lifetime of disappointment, she’s afraid to open her heart and let the emotions in. But when she finally does, will she find her happily ever after or will a secret Gabriel has kept from her tear them apart? Jenna Munson has lived her life with her heart locked up tightly. When she finally allows Gabriel Gonzales to unlock it, she finds out some devastating news causing her to turn to the one thing that she could rely on, drugs. Ashamed for her actions, she sets off away from her band and her brother Brennan for some much needed space. She has a decision to make. Does she choose to lock her heart up again so it can’t be broken, or does she learn to forgive Gabriel for his faults and love him with no regrets? No Regrets is the continuation of the Live Today Series about Trust, Betrayal, Family and Love. Author Bio: Born & raised in Sunny Southern California, but now living in the mostly freezing Midwest. Always had a passion for writing. And after living in the world of RP (role-play) writing for others, I decided to venture out on my own and write for myself. I am blessed to be able to get the story of Jenna and Gabriel out of my head and onto paper (or the computer if you will) for everyone to enjoy! -Do you have a quirky thing you do when you are writing? Not really, I do love to listen to music while I write. -What is one thing that people do not know about you? I have a crazy antenna ball collection. -What is one thing that you want people to know about you? I'm just an ordinary mom that just graduated from med school that has loved to write since I was very young. -How do get ideas for your books? To be honest, I have loved the name Jenna. And I had the characters of Live Today roaming in my head for some time. I googled the name Jenna & searched Images to give me someone to visualize and ironically the band members from Tonight Alive fit my characters perfectly. So, here's a shout out to Jenna McDougall (Jenna Munson), Whakaio Taahi (Gabriel Gonzales), Cam Alder (Brennan Munson), Matt Best (Matt Harper), and Jake Hardy (Drew Johnson) from Tonight Alive for being more of an inspiration than I could imagine. -What made you want to become a writer? I've always written stories. I took writing and creative thinking classes in both high school and college. But it was the encouragement of a dear friend that finally gave me a push into writing. -What do you think people will love most about your book? I've been told that fans have fallen in love with the reality of Live Today. It's full of real life events that the reader can relate to. it has real sorrow, betrayal and laughter. -Who is THE ONE Author that makes you fangirl? Ooh, that's a tough one. I would have to say, I am a total Teresa Mummert Fangirl! She is such an amazing author! I really get sucked into her books. -What is your favorite book that you have read? Favorite all time book hands down that I can read over and over again (even though it has a few grammatical errors) is The Pirate Series by Bec Botefuhr. Something about Jax and Jade gets me every time! -What television shows do you watch the most? Honestly, I don't watch a ton of television. But when I do. It's definitely Vampire Diaries and The Walking Dead. -Let’s play Best Friend, Boyfriend or Brother….name who you would put in each category. It can be celebrities, book boyfriends, models or anyone you want. Best Friend- I would have to say Shawn Dawson. He seems like someone that I would have a great time with with no pressure. -Name one thing in your life that you would like to do that you haven’t done. Hmmmm... If I had to pick one thing, I think I would have to say Travel the world. 1. Visit each state in our beautiful Country and learn the history of each. -How do you determine the cities, states etc. where your book takes place at? Well, with Live Today, their original home town was simple. I'm from southern California, so that's where I based them from. But Washington??? I don't have an answer to that. It's just where my mind took them. -Who is the person that has influenced you the most in your life? This is a tough one. There are too many people to mention from family to close friends to old dance teachers. -What is your favorite genre to read? This depends on my mood. Usually some type of romance. -What is your favorite quote from your book? "It's always been you Jenna. Since the moment I laid eyes on you, I fell so hard the earth shook." -What genre of music do you listen to? Everything I find myself in the mood for. I am NOT a huge fan of country.